You have 1190 characters. Don’t forget to add important and relevant keywords in your description to improve your iTunes app page and optimize your SEO. Your app's last version was released on March 29, 2013. It is important to regularly update your app. Best practices recommend to update your app every 4 to 6 weeks. This means fixing reported bugs, improving existing features, launching new features etc. Keep an eye on users' feedback. The next great features may already be asked by many users. This article is about the Greek tales. ?Aesop's Fables or Aesopica refers to a collection of fables credited to Aesop (620?560 BC), a slave and story-teller who lived in Ancient Greece. 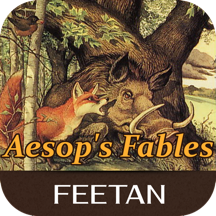 Aesop's Fables have become a blanket term for collections of brief fables, especially beast fables involving anthropomorphic animals. His fables are some of the most well known in the world. The fables remain a popular choice for moral education of children today. Many stories included in Aesop's Fables, such as The Fox and the Grapes (from which the idiom "sour grapes" was derived), The Tortoise and the Hare, The North Wind and the Sun and The Boy Who Cried Wolf, are well-known throughout the world.